We feel that poetry lost its way in the 20th century, to the point that mainstream readers have forgotten how moving language alone can be. As a result, most people learn to find their feelings in music, movies, and novels, while poetry languishes on its lone shelf in the bookstores, waiting only for the occasional cameo at a university workshop. This connection is more direct than any other, and it doesn’t take a Hollywood budget to do it. Read the poems on Rattle.com for free. Write a poem on a napkin and share it with a friend. Keep a journal and send us a page. Participate. The pure love of language is one of the most important experiences in the history of human culture, and somehow most of us have forgotten about it. More than anything, our goal is to promote a community of active poets. That means we care as much about submitters as subscribers. Lawyers, landscapers, homemakers, and Pulitzer Prize winners are all treated the same—and we’ve published them all. Many literary magazines cite a percentage of content that comes from the “slush pile,” meaning work sent in unsolicited. In most cases this percentage is less than 50%, meaning more than half of the content was solicited, meaning you never had a chance. At Rattle, almost every poem we publish starts in our “slush pile,” and has to rise through the same process of careful consideration. We only occasionally solicit work, and for representational balance, not prestige. We don’t ask for or publish the standard credit-listing bios; we don’t even read them. If we like your poem better than the Poet Laureate’s, we’ll publish yours. That’s what makes Rattle so readable. Being an active community of poets also means that we’re always looking for feedback, and that the editors will always be available through email and Facebook and Twitter and whatever interactive technology comes out next. There’s nothing special about us; there is no ivory tower, and no etiquette to worry about breaking. So tell us what you think. 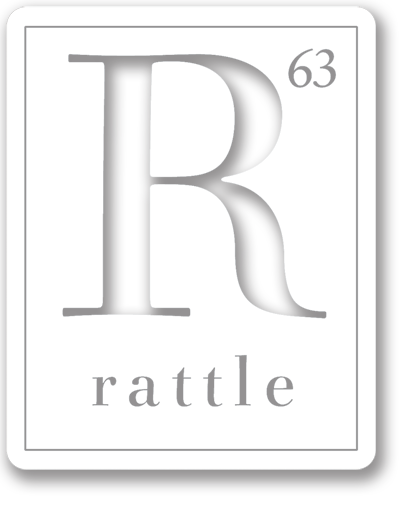 Rattle is published in several forms, in effort to find as many readers as possible, but the primary version has been our print issue, originally twice per year, but now appearing quarterly in March, June, September, and December. Each issue is roughly 100 pages of poetry and an interview with a contemporary poet. Most issues have a tribute section, focusing on a specific stylistic, ethnic, or vocational group. Recent tributes have focused on sonnets, African American poets, cowboy poets, visual poetry, and nurses. Every poem we’ve published has or will appear on Rattle.com as part of our daily blog, which features a poem every day, or, occasionally, relevant prose. Many of the poems include an audio clip of the poet reading their work. At Rattle, anything always goes. If a poem is accessible, interesting, moving, and memorable, if it makes you laugh or cry, then it’s the kind of poem that rattles around inside you for years, and it’s our kind of poem. Rattle is a publication of the Rattle Foundation, a 501(c)3 public charity.